Staffy training tips are really important as Staffordshire bull dogs can be bundles of energy when they are young. Sometimes it is best to start training as soon as you bring him or her home. Understanding that when your staffy is under 12 weeks old, he or she needs to become familiar with people and other animals. Make this time a positive experience for your pup so that he builds some self-confidence, and does not take on any kind of fear. When you want your puppy to follow a command, repetition is really important. Try to practice your commands several times throughout the day, and alternate between praises and hugs with his or her favorite treat for the best results. Using repetitive commands on an ongoing basis will build your dog’s confidence allowing them to remember and following your commands for life. Discipline training for your staffy pup is crucial, and regardless of what kinds of training method you employ, speed and being consistent are important attributes to use. 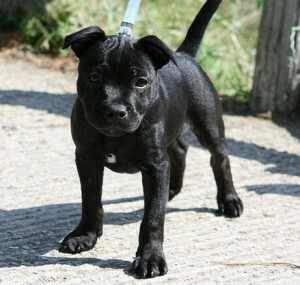 Your staffy puppy will learn commands quicker if you correct his or her behavior every time they need it. You don’t want to send your staffy mixed signals, or encourage any bad behaviors. Positive reinforcement training is best, and should be used on a regular basis. Toilet training your staffy is a combination of patience and perfect timing. 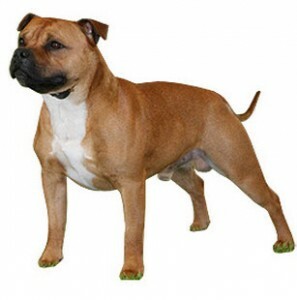 It is your responsibility to train your dog to go outside to use the toilet, and it’s best to employ a regular routine around feeding time so that your staffy pup doesn’t end up soiling your home unnecessarily. After feeding your dog, create a routine where you take him or her outside to use the toilet. Set a schedule for the morning, midday, feeding time, and evening for your staffy to ensure that there are no mistakes. Some other useful staffy training tips include reinforcing good behavior, and looking for ways to avoid any triggers that may cause your staffy to display bad behaviors. Your staffordshire bull terrier may need to get outside and go for a walk to get some fresh air, or maybe he is starting to experience some separation anxiety. Pay attention to what your staffy pup is feeling and work to help him curb these behaviors in a positive way. Training Staffy pups can be an enjoyable task when you are in the right frame of mind. Starting early with puppy training and not caving in to bad behavior are ways to create a solid learning environment for your pet. Because dogs are pack animals, you want to establish yourself as the pack leader. Reward good behavior, and withhold rewards for undesired behaviors. Your Staffy pup’s favorite treat or a few moments of love and praise will give your puppy idea of what is expected of him or her. When you are just beginning a training program with your Staffordshire Bull Terrier puppy, remember to be patient and consistent. Puppies tend to be easily excited, and can often get distracted from long training sessions. Just a few minutes of training a couple of times a day should be adequate while your Staffy is still small. Be quick to reinforce good behavior so that your dog will start to relate the behavior to the reward. Minimize undesirable behaviors with no reaction as this will help your puppy understand their training better. Toilet training is one of those things that can frustrate almost any pet owner. Like other facets of dog training, this is one of those areas where you will need to be patient and diligent. It is not an altogether impossible task, and when you approach the situation from your puppies point of view, you will understand that your puppy will respond better if you have a good sense of timing. Realize that your Staffy doesn’t yet make the connection that they go to the toilet outside, not inside. Keep a keen eye focused on your pup and if he looks like he has to go, take him outside. Set up regular feeding schedules, and spend some time learning about crate training as these methods might be helpful in toilet training, your Staffordshire bullterrier puppy. You want to make training staffy pups as fun as stress free as possible for both of you. Proper dog training takes skill, time, and patience. Realize that it doesn’t happen overnight, and you will be setting better expectations for you and your dog. It will be easier for your dog to learn, and better for both of you to have a more positive approach. Bonding is extremely important and beneficial to your Staffy, so let go and have fun with the training. You will find that this also strengthens trust and the long term relationship. Do You Take Your Staffy to the Vet Regularly? Natural Remedies to Rid Your Dog of Ticks and Fleas do they work ? What Causes Staffordshire bull terriers to Get Arthritis? Thinking Of Buying a Staffy Pup? You Must Read this first!